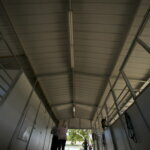 Ojai Valley School maintains beautiful stables and riding facilities on each of its two campuses. 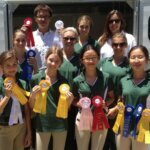 At the Upper Campus, grades 9-12, riders have access to dressage and jumping arenas, a wooded three-mile trail that circles the campus, and box stalls with runs for 22 horses as well as paddock and pasture space. At the Lower Campus, grades PK-8, the facilities include a new barn with 12 box stalls with runs for private and school horses, 11 paddocks, a large riding arena and PK barnyard. 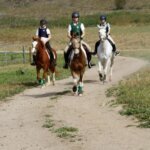 The school owns about 40 horses and ponies suitable for riders of all ability levels. 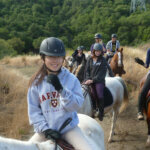 Students are encouraged to ride many different horses during the year as each horse teaches something new. Instructor Caitlin Cooper at Lower Campus. 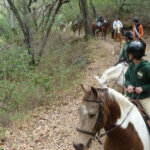 Trail riding Pi Course at Upper Campus. Interior of Lower Campus stables. Riders at 2013 jumper show. Horse camping near Santa Barbara.